Movement is one of the things that differentiates a living thing from a non- living thing. When we speak about locomotion and movement, we often use one for the other. But, it is important to understand the difference between the two in relation to living things. Movement is when the living organism moves a body part or parts to bring without a change in the position of the organisms. Locomotion is when the movement of a part of the body leads to change in the position and location of the organism. Both of these are brought about by the joint efforts of the skeletal and muscular systems. Movement is seen in both vertebrates and invertebrates. Amoeboid movement is brought about by pseudopodia which are appendages which moves with movement of protoplasm within a cell. Ciliary movement is brought about by appendages called as cilia which hair-like extensions of the epithelium. Both these kinds of movements are seen with cells of the lymphatic system. Muscular movement is a more complex movement which is brought about by the musculoskeletal system. This type of movement is seen in the higher vertebrates. To understand more about the movements brought about by the musculoskeletal system, we need to understand the types of muscles, and joints. These muscles are voluntary in nature which means their movement is under the control of our will. They are mainly responsible for bringing about the movement of posture and location of the organism. They are called striated muscles due to the presence of striations present on them when seen under the microscope. These muscles are involuntary in nature which means their movement is not under the control of our will. When seen under the microscope, they do not have any striations on them. These muscles are found in the digestive tract and reproductive system. These muscles are specialized muscles that are found only in the heart. 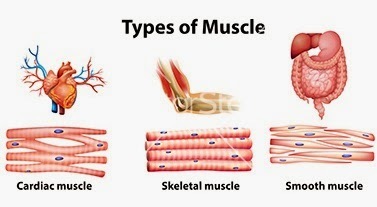 They are involuntary muscles which have striations on them. They have the property to contract and relax in a rhythmic manner. The skeletal system is made up of bones and cartilages. There are a total of 206 bones in the body. 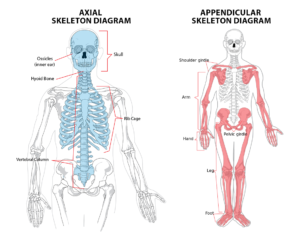 They are divided into the Axial skeleton and the appendicular skeleton. The axial skeleton consists of bones that are found towards the center of the body including the skull, the vertebrae, and the sternum. The appendicular skeleton consists of bones that are found in the extremities. They form an integral portion of the locomotive apparatus. A joint is a name given to two or more bones that articulate with each other to bring about a movement. Depending on the type of movement they allow, joints can be of three types: Fixed, slightly moveable and moveable joints. Q: What kind of muscles are found in the reproductive system? Reproductive system has smooth or involuntary muscles that are not under the control of our will.